There’s a spot by our pool that has been covered with unruly groundcover since long before we moved in. Since it’s right next to the pool we decided it was a perfect location to put pink flamingos, which my husband has a love for. 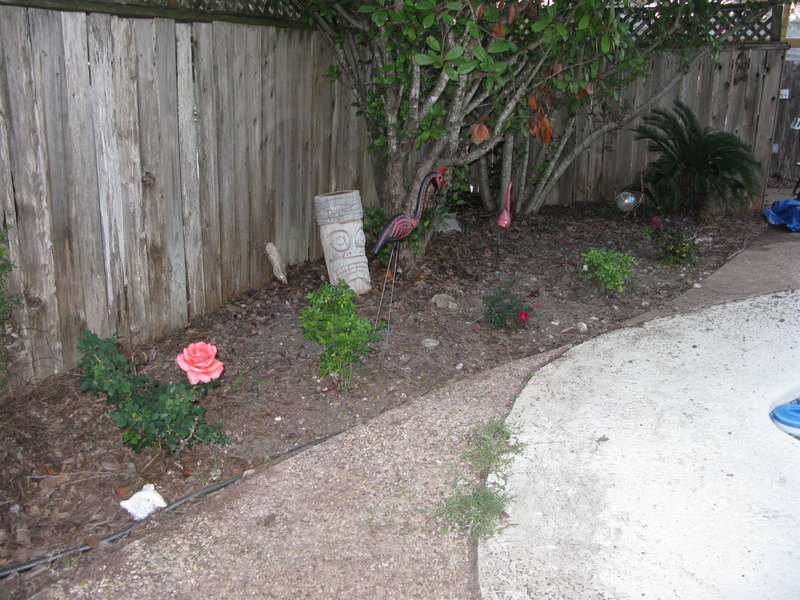 Last summer, after being in the house for about 6 months I also noticed a random rose bush in the middle of it all. Well this year, I decided to expand and for my birthday last week I ripped out all of the groundcover and added in another 5 rose buses to complete the flamingo rose garden. Shouldn’t everyone have one of these?? I'm thinking of mulching with tumbled glass. Regular old mulch just doesn't seem good enough in this garden. Yes that's a tiki back there. Do you really have to worry about being tacky when you've gone this far? I bought this one at The Great Outdoors just before Halloween. It was just too cute. Cinco de Mayo. I just couldn't pass this one up. She's so festive! 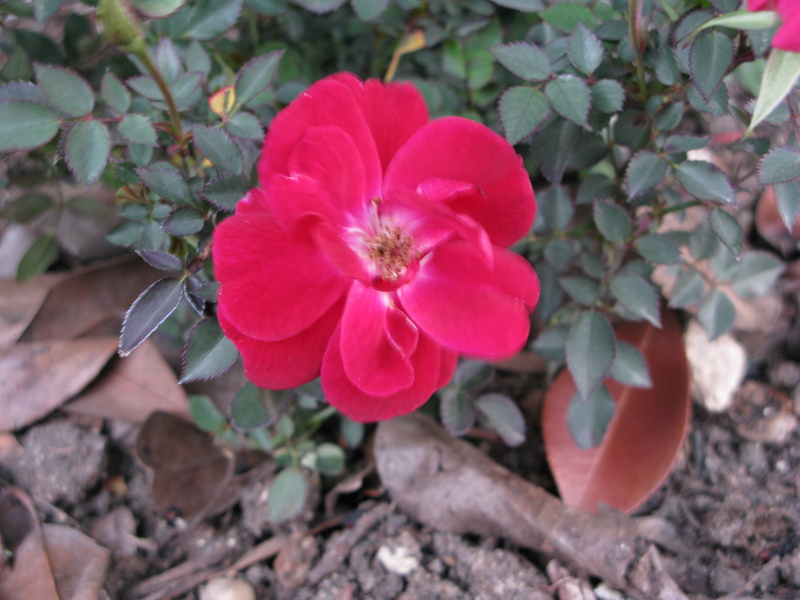 I'm not sure of the name of this rose. 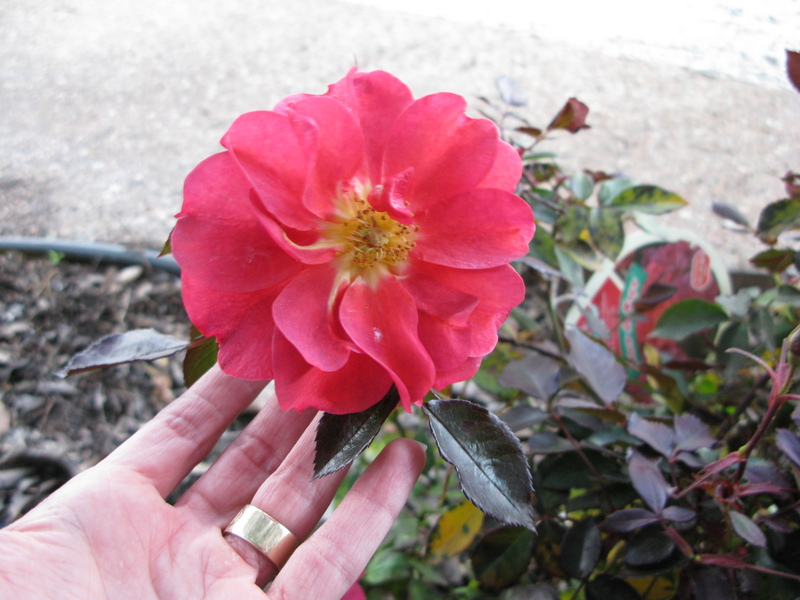 This is the one that was already in the garden. I had to show a picture with scale. This is about 6 inches in diameter and about a quarter the size of the bush. It is really something. 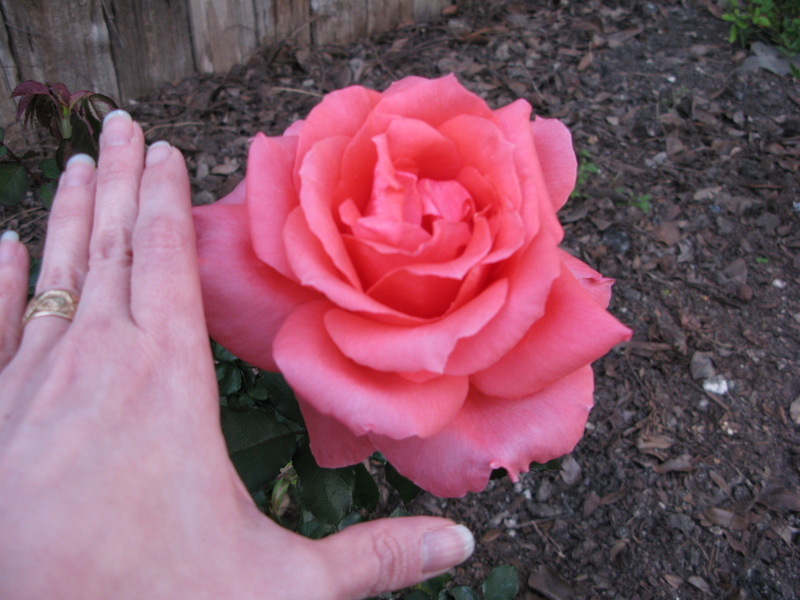 Wow, what a rose, that thing is huge. 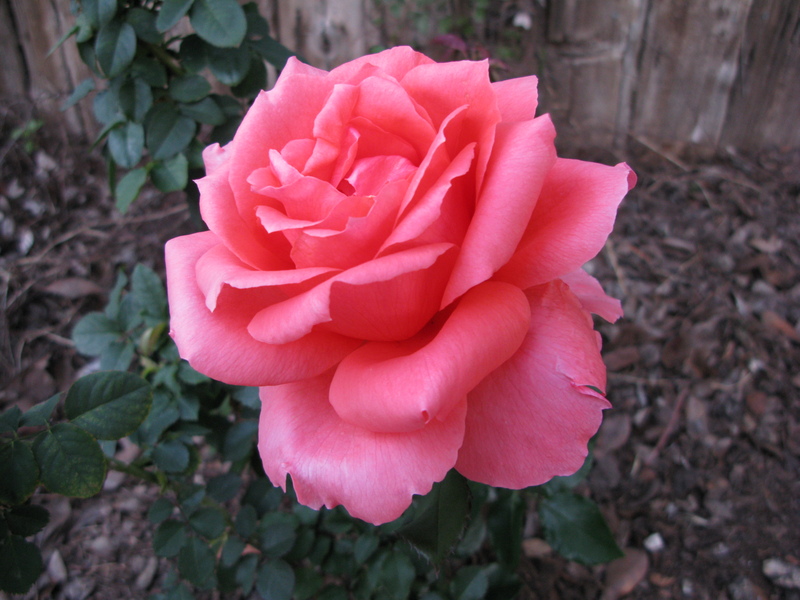 The color is unusual as well but beautiful. If you remember the name would you let me know? Thanks, it feels good to me back. Diana – I don’t know if it shows really well in the pic, but the Cinco De Mayo has dark purple around the edges too. It really is something. Bob – I wish I knew the name, but it was already here when I moved in. There’s no remembering about it, unfortunately. If I ever find out though I’ll be sure to post. Pretty roses, Laura. I especially like the Cinco de Mayo — what a unique color on that one. The whimsy of the formal roses with the flamingos is fun. Good to see you again today. 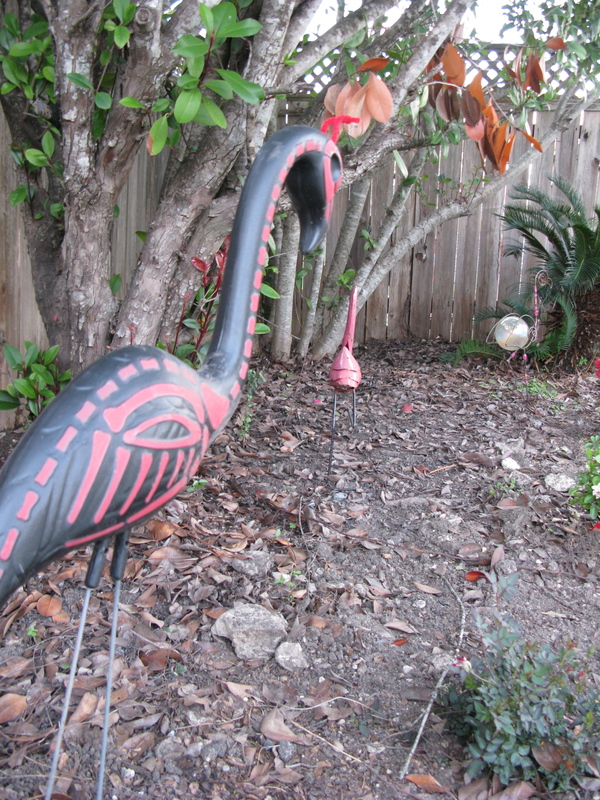 I love flamingos in the garden! Happy belated birthday to you. It was really nice to see you today!